QMX's line of Artisan replicas has been pretty fantastic so far - they've given us incredible models of the likes of Firefly's Serenity or Wrath of Khan's Reliant. But then there's... well, there's this. This replica of part of the Firefly-class' Hull is 1:3 scaled, so it's around 32" wide and about 24" high, and is made of 'aircraft-grade' aluminium. 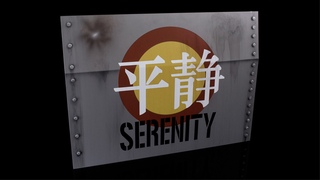 So it's literally just a big ol' sheet of metal with the Serenity's name and logo on it. You know, to hang on your wall with all the other gigantic hunks of aluminium you own. On top of being a largely unwieldy slab of metal, this piece of Hull is also a rather pricey slab of metal - it fact, to be precise, it's $400 of metal. Which... I dunno guys, I get that everyone thinks Firefly fans are a wee bit crazy and will buy anything related to it (basically like every other fandom ever really), but this is just silly. But then again, my desk is covered in nerd crap, so you're more than welcome to decorate your walls with bits of the Serenity - and if you are interested, you can head on over to QMX's website at 10am PST to place a preorder.